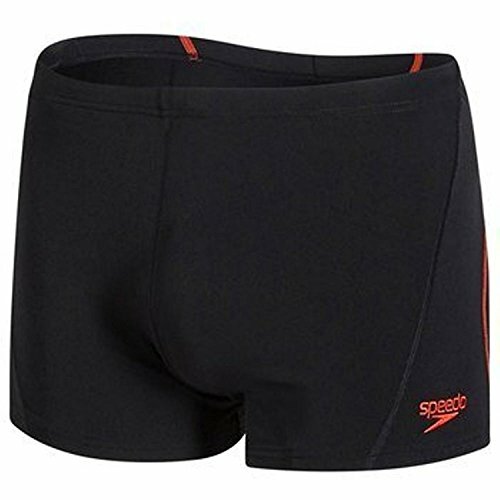 Product Description The Speedo Solid Endurance men's square leg swim suit is crafted using the durable and comfortable Speedo Endurance+ fabric. This construction is fade-resistant and will not stretch even after repeated exposure to chlorine-treated pools or body lotion. The UV protective UPF 50+ construction protects your skin from harmful sun damage. From the Manufacturer Speedo is the number one swimwear brand worldwide and equals better fit, performance, quality, and technical innovation. But we are also known for our relaxed lifestyle swimwear for the beach and beyond and our consumer promise is that you will look and feel your best while you compete, train for health, have fun, or relax. All performance suits from Speedo receive exhaustive testing sessions, technical fit analysis, and long workouts by Olympic athletes to help us perfect the suit's fabric, fit, and engineering. So you can wear your Speedo swimsuit proudly and confidently! The Solid Endurance Square Leg swimsuit is a great core style and is made of our exclusive Endurance+ chlorine resistant fabric with an improved 4-way stretch. The square leg cut with a bit more coverage than the traditional 3" brief has been gaining popularity and has the added benefit of muscle compression to assist in making you more efficient while swimming. Ideal for competitive and lap swimming or any water activity.